An award-winning architectural practice has bolstered its design expertise with the recruitment of a first class interior design graduate. Naru and Ross Architects – a firm based near Yarm which is known for its work with some of the North-East’s most stylish hotels, restaurants and bars – has appointed Rebecca Hayman as an interior design assistant. 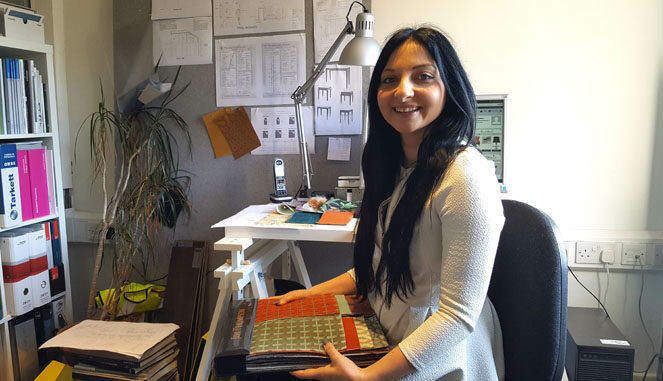 Having successfully completed a BA Honours Degree in Interior Design in 2015 with the University of Teesside, followed by a period working in industry, Hayman’s priorities are to support the success of the company’s commercial projects. As well as interior consultations, styling and providing advice on the latest design trends, the 25-year-old’s responsibilities include creating moodboards and sourcing samples to consolidate ideas, sourcing furniture and cabinetry and researching interior finishes such as wall coverings, flooring, lighting, soft furnishings, sanitaryware and decorative accessories. Along with hotel, bar and restaurant commissions, including Sohe in Newcastle, The Bay Horse in Hurworth and Cena in Yarm, the company’s architectural and interior design work covers a range of other projects, including listed halls, country estates and luxury new builds. The move to create a more focused architecture and interior design service reflects current market demands. “We’re delighted that Rebecca has joined our professional practice,” said Naru and Ross Architects director Carl Ross.